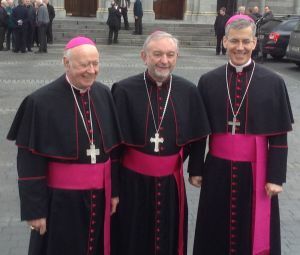 A missionary bishop for a missionary Church: Bishop Kieran O’Reilly appointed Archbishop of Cashel & Emly, Ireland. | Is The Pope a Catholic? « Marriage Referendum would remove ‘man-woman-child’ marriage from Irish law. Back in May 2010, Fr Kieran O’Reilly was appointed Bishop of Killaloe, replacing Bishop Willie Walsh. I liked the sound then of a bishop whose whole life experience as a pastor had been in a missionary context. It isn’t really surprising then that Pope Francis has today appointed a missionary to one of the key roles in Church leadership in Ireland: Bishop Kieran is to be the new Archbishop of Cashel & Emly, joining Archbishops Eamon Martin, Diarmuid Martin and Michael Neary as one of Ireland’s four Archbishops. The appointment is another source of hope for the future of the Irish Church: recent episcopal appointments have added a group of young(ish! ), dynamic, courageous – and (hopefully!) holy – people to the Irish Bishops Conference, men such as Bishop Brendan Leahy, Bishop Kevin Doran, Archbishop Eamon Martin among others – people who inspire confidence, who are not shy about speaking in the media, presenting the vision of the Church calmly, compassionately, clearly. Along with the many groups of lay people who are creating pockets of dynamic evangelisation, they seem well prepared to man the missionary field hospital the Pope is calling the Catholic Church to be. In all this, I think we should be ever grateful to Pope Emeritus Benedict for sending us Archbishop Charles Brown, a truly outstanding Nuncio, at a most opportune moment.